Support Games: All Mobile games which are support gyroscope. Support Modes: iCade, Android joystick, keyboard, specific iOS mode. not all Smart phone and tablet under Android system have gyroscope chip in itself, if not, then it must be support OTG. At present, due to the limitations of connection APP, Jailbreak IOS or root Android is necessary, PC can use directly. 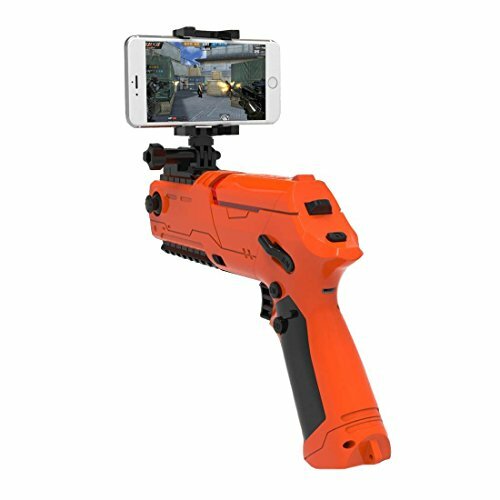 First gun-shapedCompatible with IOS, Android and PC systems via Bluetooth 4.0 ,It is the first rifle FPS game controller for mobile devices in the world, it will will redefine the FPS HTC Vive Virtual Reality device Controller with recoil, 4-axis asynchronous anti-vibration design，providing the most immersive VR shooting experience.